For years, the record industries have inserted subliminal messages into music so that they can turn teenagers into brain dead zombies who do nothing but buy, buy, buy. And whenever the musician or band finds out the truth, the record company silences them to keep the truth from coming out. When the hot boy band DuJour discovers this, their manager, Wyatt Frame, under his evil, corrupt boss, Fiona, has the plane they are flying in crashed and him looking for a new band to use for their evil schemes. 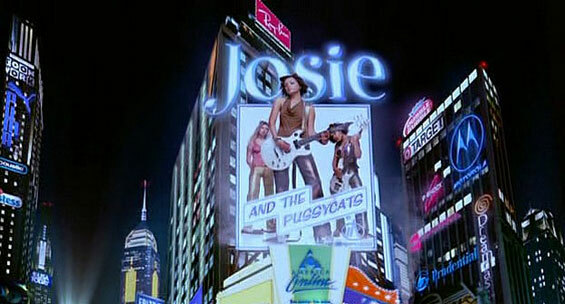 Enter Josie (Rachael Leigh Cook), the ditsy Melody (Tara Reid), and the tough Valerie (Rosario Dawson), from Josie and the Pussycats, a small band who wants to make it to the big time. When they are discovered by Wyatt, they give in and become big rock stars. But will they find out that they are just pawns for the record industry or will fame take them over? otsoNY Comments: Don't be fooled into thinking that New York's Battery Park now has or rather had in 2001, a large MacDonald's Golden Arch or that the Empire State Building had moved closer to Times Square. 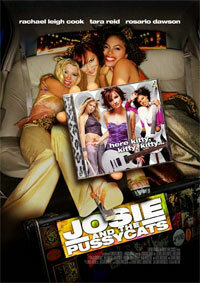 The entire film was shot in Vancouver, British Columbia, Canada. 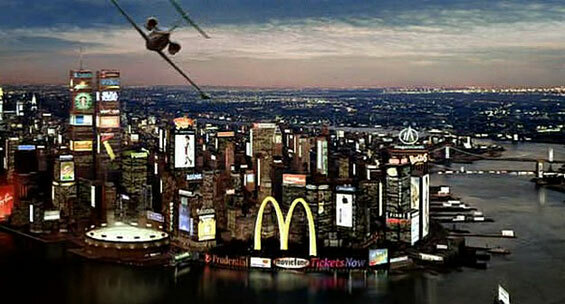 All New York scenes were shot with the help of CGI.